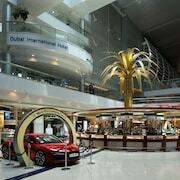 Terrific location - supermarket about 50m away, Metro a 2 minute walk and Dubai Mall only 1 stop away on the Metro. Funniest place to fix the hairdryer. In the drawer on the bedside table - not moveable and no mirror nearby! It staff where so helpful and welcoming. They were so professional and so humble loved it. Wanted to charge for pack of ketchup, only thing we didn't like. I’m glad I booked Abidos hotel apartment Al-Barsha staff was very helpful and caring checked me in earlier then I was suppose to and I’m thankful to them for understanding. I’m future I’ll definitely b booking again at the same hotel .